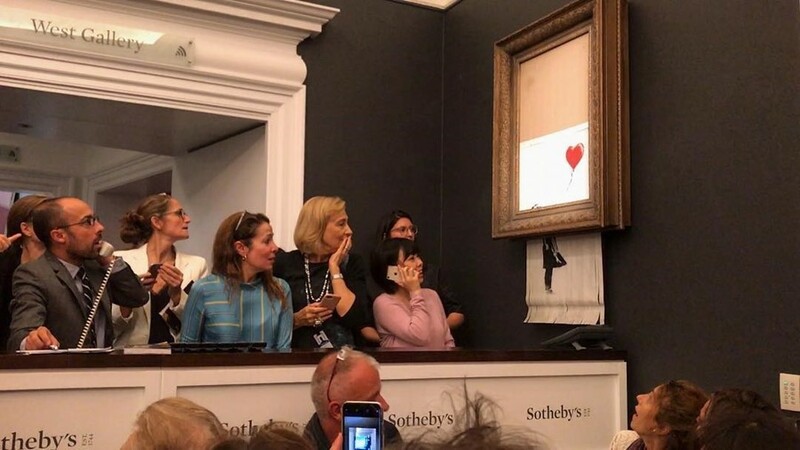 One of Banksy’s most famous artworks, Girl With Balloon – voted the UK’s best-loved work of art last year – tripled estimates to sell at London’s Sotheby’s auction for just over £1million on Friday evening. Then it promptly self-destructed. Ironically, Joey Syer, co-founder of a website that resells Banksy pieces, MyArtBroker.com, predicts that the destruction of the artwork won’t see it drop value; quite the opposite. “This is now part of art history in its shredded state and we’d estimate Banksy has added at a minimum 50% to its value, possibly as high as being worth £2m plus,” he says. “Given the media attention this stunt has received, the lucky buyer would see a great return on the £1.02m they paid last night.” Could Sotheby’s have been in on it, participating in the stunt to inflate the price? While Banksy claimed the attention, though, it was another British artist that claimed the top spot, value-wise, at Friday night’s Sotheby’s auction. Jenny Saville’s naked self-portrait Propped – one of the British painter’s many artistic studies of flesh – sold for £9.5million, surpassing her previous record of £6.8million.